y before the American Association of Orthodontists annual meeting. Not all orthodontists offer lingual treatments since specialized training and technical expertise are needed. 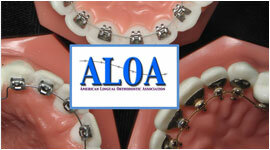 The American Lingual Association of Orthodontists (ALOA) is an organization of those dedicated to using lingual braces. Dr Riolo has been using lingual appliances since 2006. He currently employs Incognito and Harmony custom lingual braces and employs the TruDef intraoral scanner to produce and submit digital models in order to manufacture Incognito lingual custom braces. 2014 ALOA congress held in New Orleans. This year’s meeting will be held at the iconic Ritz-Carlton in the upbeat French Quarter about 20 minutes from the airport.